Lisa & Pat caught in a candid moment during the portrait shoot. 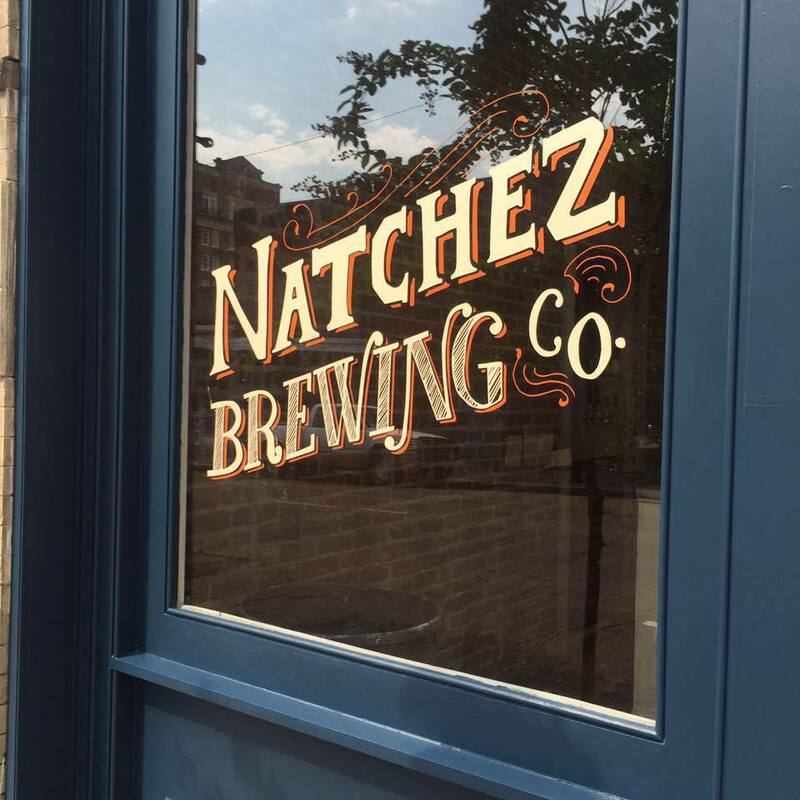 Meet Pat & Lisa Miller of the Natchez Brewing Company. I got the opportunity to meet Pat and Lisa during the recent Food & Wine Festival in Natchez, Mississippi. Visit Natchez had hired me to shoot the weekend fest, and the very first stop of the restaurant tour was The Camp Restaurant under the hill on Silver Street. That’s where I met this friendly and interesting entrepreneur couple who brew craft beer. One thing led to another, and we arranged to have an environmental portrait taken of them at their brewery on Franklin Street in downtown Natchez. In Environmental Portraiture, the idea is to capture your subjects in their environment; in other words, in some context of their life, their work, or what they do – in their surroundings. This is quite a different approach than studio portraiture, where you photograph your subject in a studio with a backdrop. Studio portraiture can be very effective in that it normally isolates the subject to that one element – them. Either approach works well, depending upon what you’re after. For Pat & Lisa, I chose to go on location and photograph them inside their brewery to put them in context as craft beer brewers. An issue with this approach is the logistics of lugging all the lighting and camera gear on location, and at this time of year the heat and humidity make it more difficult. There is also the issue of the context (the surrounding, or set), and getting it right. This often must be carefully staged and arranged to bring out all the elements that are needed so that the viewer of the image knows what is going on. How does one capture all that information and communicate the emotional impact of that entire few seconds into just a single photographic image of just one part of that sequence? That is the challenge of still photography, and why I love it so much. That’s also why I must pour more thought, planning, and staging into the image I am going for – so that I effectively communicate the experience – not just a simple scene. This can sometimes be lost on photographers even – especially those who come from a photo-journalistic background whose strict guidelines go by the mantra of never changing or altering anything in the scene. An analogy would be akin to marching band drummers with their strict regimen of exact drum-line drumming sometimes having difficulty switching to playing jazz, which is loose and improvisational drumming. Environmental portraiture is not photo-journalism. In this style of environmental portraiture, I am conveying the emotion and the experience of the entire scene’s panorama and sequence, not taking a forensic evidence shot of just what is there in that second and in that one narrow place that is within the frame of my camera’s lens. Scouting shot taken a couple of days before the real shoot. How is that done? How can I communicate the emotion of a scene … of an experience? Well, some key elements of achieving this are in how I choose to stage and light the scene. The image at left is a scouting photo I took a couple of days before the shooting session. It’s always a good idea for me to scout out a location and look for the best angle to begin to work with in order to have the most optimal starting point to portray my vision of the portrait. 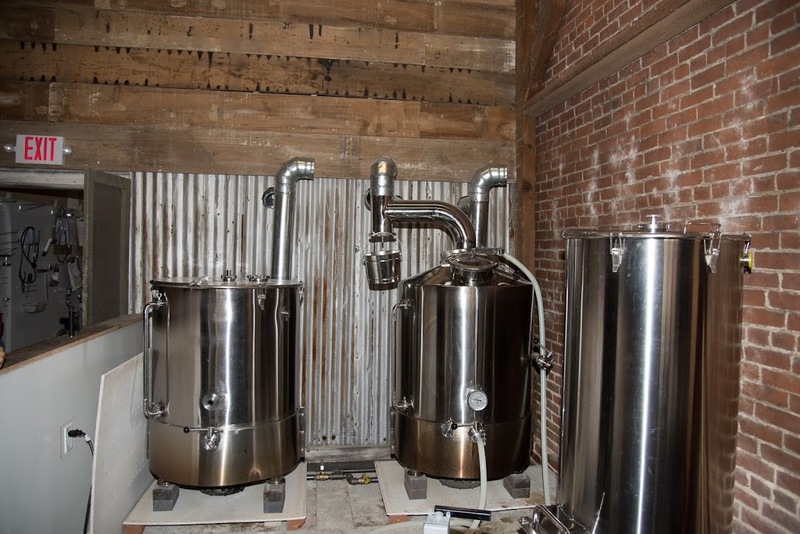 In this shot, one can see the beer tanks – which I thought was key. However, the scene is very cold, cluttered, industrial, and needs a lot of work to make it more interesting. In particular, the white wall along the left, the exit sign, and the clutter along the floor need to be addressed. I had two assistants helping me on this shoot: Pam Swayze and Taylor Cooley. I enjoyed their help and their creative input in working to make this portrait “pop.” I very much enjoy operating with a talented team of photographic assistants such as Pam and Taylor when I get the opportunity. There were plenty of items in the building that screamed “beer brewery” – such as large wooden barrels, old bricks, kegs with their logo on them, and of course – the beer itself. So fortunately, I did have some interesting and appropriate items to work with. After Pat did a general clean-up of the area, I used all of these in various arrangements, moving them into the scene and tweaking their placement until I got a more interesting look. Pam did a great job of arranging the beer onto the top of a barrel, and pouring it into glasses. After this was done, I moved on to working out the lighting in order to give the scene drama and character. The “key” light is to camera right, and is a large 53″ Rotolux octabox (softbox) mounted onto an Elinchrom mono-strobe. It is up fairly high, mounted on a c-stand equipped with a boom arm, angled toward the subjects. A fill light was added to camera left, on yet another c-stand with a boom arm. This one was a 27″ gridded beauty dish mounted onto a Paul C. Buff “Einstein” mono-strobe. Three Nikon SB910 speedlites were strategically placed along the brick wall to the sides and rear, pointed up to give texture and mood to the wall. They were gelled using Magmod creative color filters. All of these were triggered remotely from my camera using Pocket Wizard radio controllers. Magmod’s entire line of modifiers for speedlites. 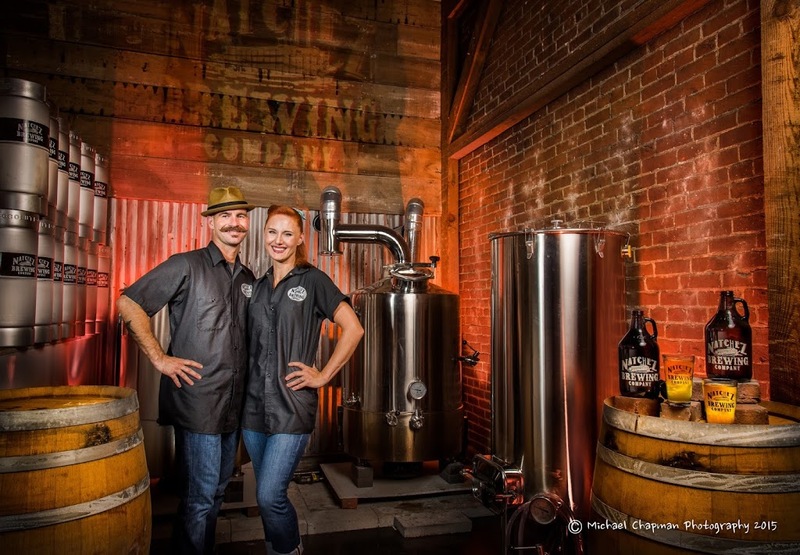 Environmental Portrait of Lisa & Pat Miller “Craft Beer Brewers” – Copyright 2015, Michael Chapman. I hope you enjoyed this look behind the scenes at what goes into making an environmental portrait such as this one. An image like this can capture so much of a person’s life story at a given time of their life, and the portrait can become something that is treasured and handed down to the next generation. If you would like your story captured in a timeless format, then contact me and we can arrange something just for you! Image 1 (“Caught in a Fun Moment”): Nikon D810; 50mm f/1.4 prime lens; ISO 64; f/4; 1/250s; tripod mounted. There are moments in a photo session when you can get some fun candid shots. I always look for moments like this. They sometimes make for the best images. Image 2 (“Logo”): This image of their business logo was used from Lisa & Pat’s Facebook page. Image credit to others. Image 5 (“Craft Beer Brewers” – Environmental Portrait): Nikon D810; Nikon 24-120mm f/4 lens (at 24mm); ISO 200; f/11; 1/20s; tripod mounted. Tripod: Gitzo carbon-fiber legs with a Really Right Stuff BH-55 ball-head. Lenses Used on this Shoot: Nikon 50mm f/1.4 Prime; Nikon 105mm Micro f/2.8; Nikon 24-120mm f/4. Lighting: Elinchrom RX400 mono strobe (x1) with 53″ Rotolux octabank as the key light; fill light was a Paul C. Buff Einstein mono strobe (x1) with a 27″ gridded beauty dish – all other lights were kickers (accent lights); Nikon SB910 speedlites (x3) with Magmod modifiers; Lights were triggered with Pocket Wizard radio controllers (x5) – Flex TT5’s, Mini TT1, and AC3 Zone Controller; stands: c-stands with boom arms, Manfrotto Nano stands with umbrella adapters, and Alzo 10′ stands. Both creative gels, as well as color corrective gels (CTO 1/4 strength) were used to help create mood and correct the color temperature of the ambient lighting. The Nikon SB910 speedlites and my Pocket Wizards are powered using Eneloop Pro AA rechargeable batteries. Post-Processing: Adobe Lightroom CC 2015 & Adobe Photoshop CC 2015. Computer & Tech: Apple MacBook Pro w/15″ retina display (shot tethered); Wacom Intuos tablet (medium); JBOD backup using Seagate hard drives for Mac (3-2-1 approach, with Dropbox as Cloud backup). – Click on the photos to enlarge. In “Characters of Natchez,” I set out to photograph a limited number of local people and portray or reveal something that is uniquely them. In doing so, I use a photographic style, lighting technique, camera angle, lens choice and setting that fits them. I don’t use a one-size-fits-all approach and squeeze them into my “box” – the “box” changes with what best represents them. Harder and more taxing upon me? Yes. But, it’s also much more rewarding in the end because it stretches me artistically and creatively to fit the techniques and style to what will best reveal them. This is “subject-centric” photographing. My entire process is designed in every way to bring out the essence (or at least one aspect of it) of that person. That’s my goal anyway. Although I may shoot five hundred photos in a given session, I am working toward the one shot that best represents the person. That image … “the one” … is what I post to my portfolio’s “Characters of Natchez” section. 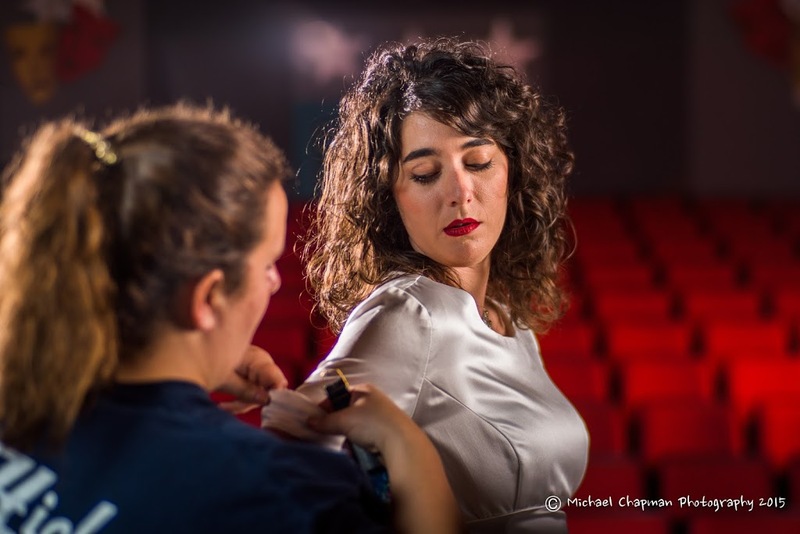 However, in this blog I provide a few extra shots for you to enjoy (hopefully), and go into the back-story of the photo shoot to reveal a few more interesting details about the person and the session. When I launched this series at the beginning of the year 2015, I had no idea it would lead to where it has. What started really as an experiment, is morphing into a fun journey filled with adventurous and amazing avenues that explore the unique people of Natchez, Mississippi and its surrounding environs. Ann Gabrielle is from Rodney, a small, practically abandoned ghost town north of Natchez. Once a thriving community, the river changed its path, the hopes of a railroad line never materialized, and the times changed. This left Rodney high and dry of not only the river, but many of its people … yet, not quite all … “There is one dwarf yet in Moria who still draws breath!” Ann Gabrielle loves, as I do, all things Tolkien, Hobbit and LOTR (Lord of the Rings); and, she knows movie lines, being the stage and vocal performer that she is. (The one above is from Lord of the Rings, said by the dwarf Gimli in The Fellowship of the Ring). I know enough about Rodney to know that the people from that area that no longer live there are very quick to tell you they are from Rodney. It is a proud and magical place still, even with the decay and ruin. Is there some fairy-dust that was once sprinkled over the area eons ago that left something special in the very earth and mud, forests and fields of Rodney? 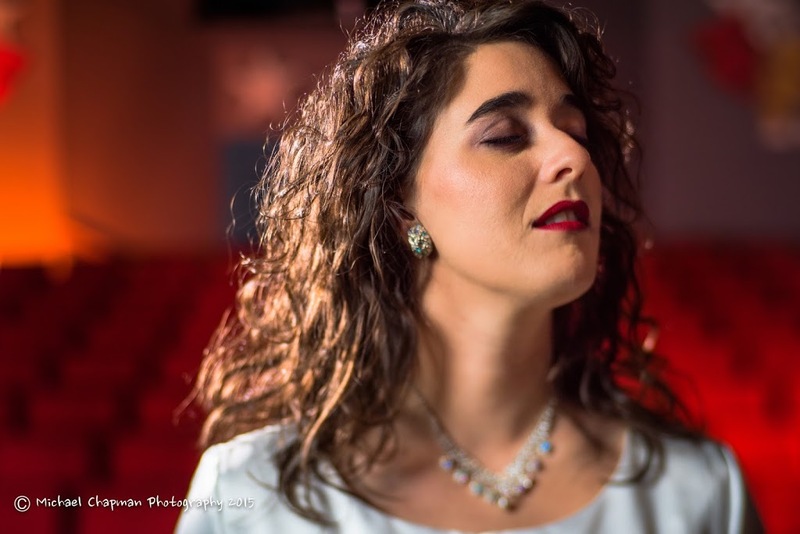 If so, Ann Gabrielle caught a good measure of it, for she is extremely gifted as an opera and vocal performance artist. So, we tried different looks, including an amazingly beautiful blue Japanese fan that they sometimes use in opera performances. In the image to the left, I captured Ann Gabrielle in profile, and changed the lens orientation from landscape (horizontal) to portrait (vertical). 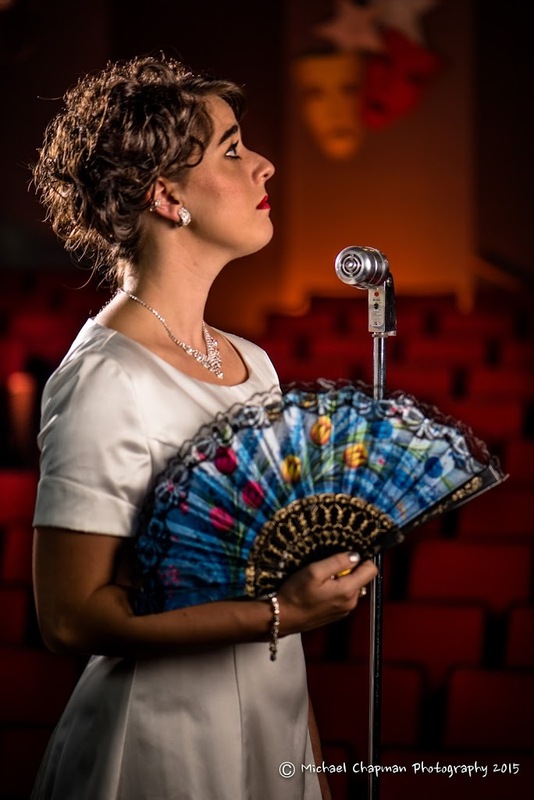 An old antique microphone was added to give the viewer the understanding of her as a vocal performer. 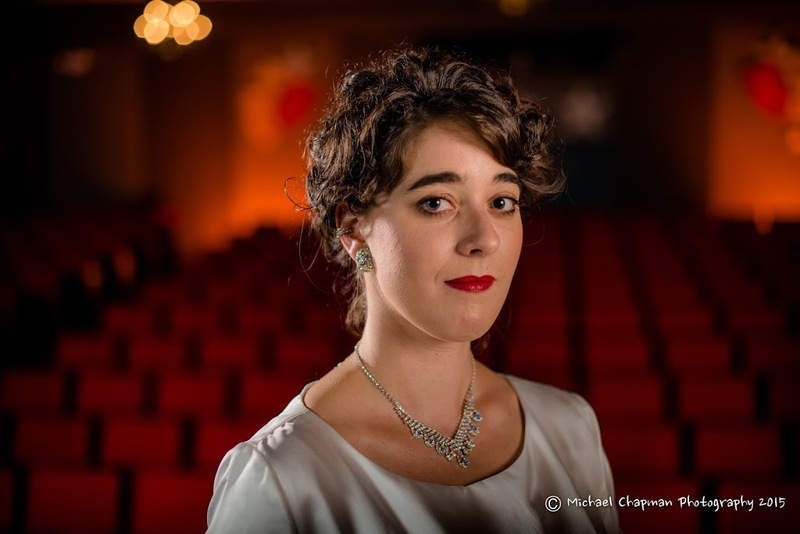 Later she told me that opera singers project volume naturally and do not use mics! (I am constantly educated on such matters, and I love learning things like that.) 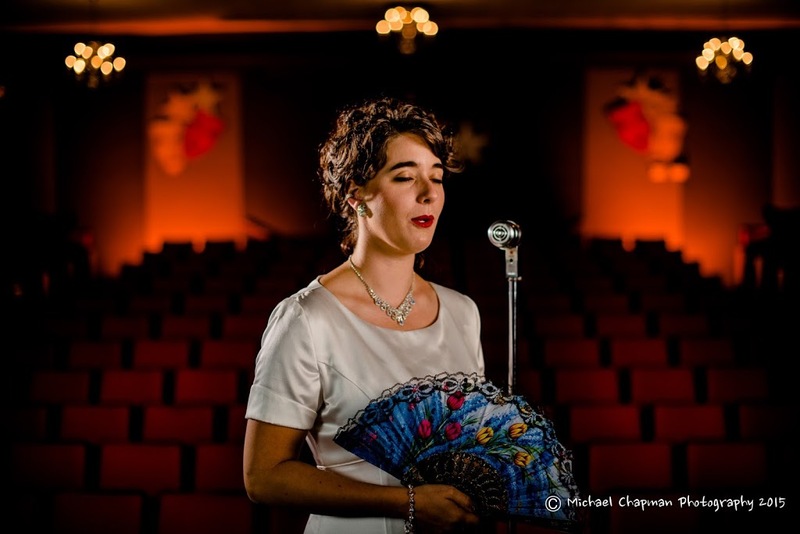 I like this image for several reasons: it shows her feminine form, it captures the mic and fan beautifully, and also shows her in the theater context. It’s no accident also that I used the angle of view to also capture her seemingly gazing at the performers masks that are hung on the wall in the back of the theater. (We also had to get on ladders and remove some distracting banners.) It took quite a bit of maneuvering to get this shot, but that’s what it takes. There are no less than six strobes being used to light this scene, including two radio-controlled speedlites at the rear of the theater lighting up the back wall. Notice the effect of a kicker light on her hair (an Elinchrom mono-strobe with a snoot) that lights the back of her shoulders and her hair beautiful, providing some rim (edge) light that provides separation from her and the background. I carefully posed her, talking with her about spinal curvature and posture, her shoulders, hands and neck. She did amazingly well! Supporting help is always a welcome. 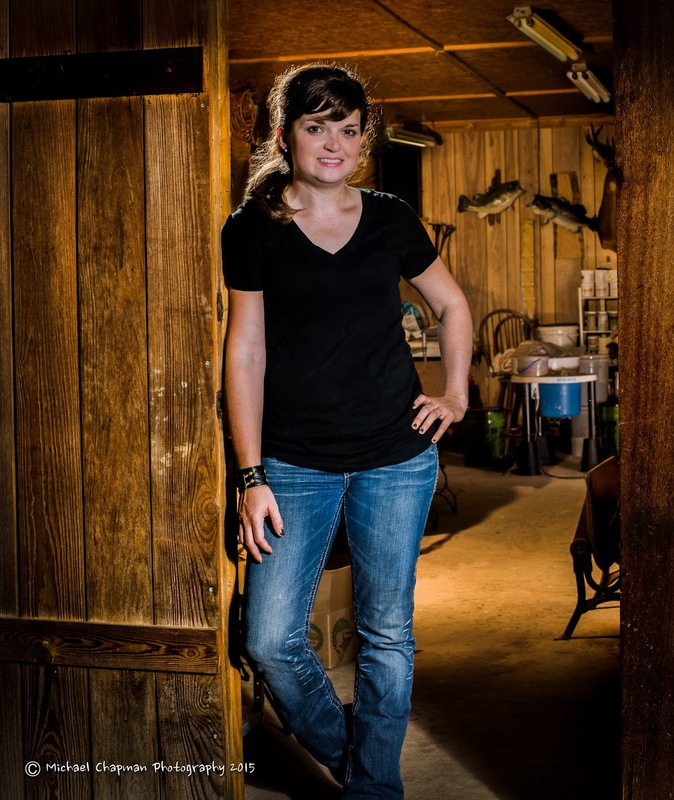 I have to mention my photography assistant on this shoot, Morgan Mizell. Morgan is amazingly talented herself (we are planning to do a really fun shoot of her), and she secured the Natchez Little Theater for this shoot location as well as being my “grip” – a lighting assistant. She also helped as a M.U.A. of sorts (a Make-Up-Artist). Ann Gabrielle actually did her own make-up, but Morgan helped with fly-away hair, wardrobe tweaks, and a million other things that involve paying attention “to the talent.” I had suggested that Ann Gabrielle bring a shimmery white or light dress, a bit of bling in a necklace and earrings, and that we would begin with her hair being up. Often a photographer is absorbed with exposure, lighting equipment, composition, flash issues, and light itself … an assistant like Morgan truly helps tremendously in focusing on other important things, and she did a really great job helping me with this shoot. Thank you Morgan! As I said: total awesomeness! At one point, I asked Ann Gabrielle to just sing away or hum, and I was immediately struck by the ease with which she entered into singing … and how passionate she was while she sang. Her voice is powerful, rich and beautiful. Photography is very, very hard work, but sometimes I catch myself saying under my breath, “Is this for real?” I really love this shot, and perhaps this one is your favorite (or maybe one of the others). That’s very much a subjective process. I took over 500 images including test shots. There are many great images from the session (in my opinion), but I was looking for “the one” for my series. The lighting in this shot is striking, and it took Morgan and myself a lot of fine tweaking and “feathering” to get everything evenly lit, as well as some creative gels on the remote speedlites. Let us know in the comments what you think. So why did I choose the image posted at the top of this story? There is just something about it that reveals her passion, beauty and intensity. It is unusual to have a portrait with your eyes closed. Agreed. But, I am not going for a “wall portrait” that is the usual “look at the camera and grin” type of portrait. I just am not concerned with “rules,” “convention,” “tradition,” or what is or isn’t supposed to work with a shot. I just know what I like and what works with what I am going for, and this one seemed to me to be a cut above the rest. It is emotional, feminine, passionate and intimate. 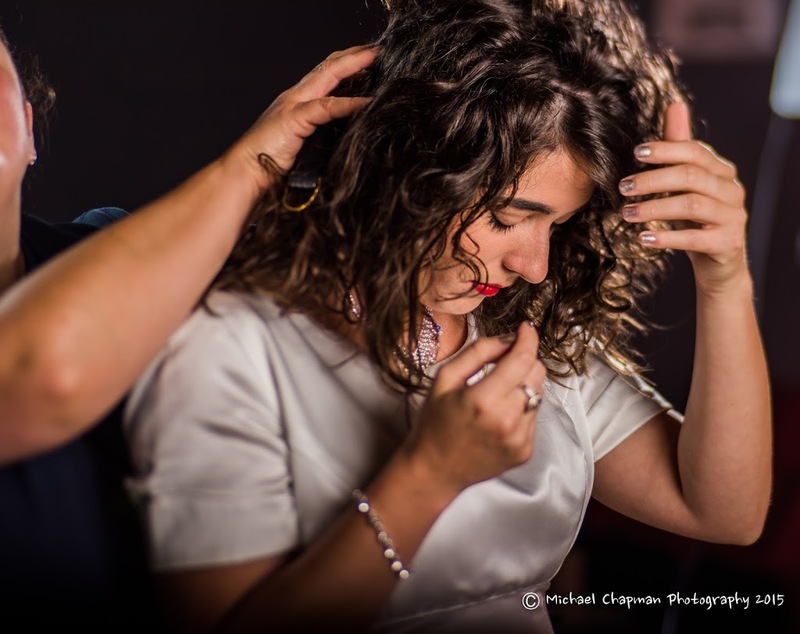 BTS (Behind-the-Scenes) shot while Morgan helps Ann Gabrielle take her hair down. Thanks for reading this story, and hopefully you learned a bit about Ann Gabrielle and my own visual art processes. Shot 1 (Passion): Nikon D810; Lens Baby Composer Pro with Edge 80 Optic (80mm); ISO 64; f/11; 1/250th of a second; tripod mounted. This shot was my choice the moment I saw it. It was not a difficult decision. Shot 2 (Professional Portfolio Image): Nikon D810; 50mm f/1.4 prime Lens; ISO 64; f/2; 1/250th of a second; tripod mounted. I love the lighting, and knew by this point my extensive lighting efforts were going to pay off. While this didn’t win for my top shot, I think it’s a solid shot for her portfolio. I’m liking at this point the choices I made in wardrobe, hair, and jewelry. It is a very important part of my process to think about how the various elements of my composition are working together … not only with color, but with shape, texture and gesture. Shot 3 (Blue Japanese Fan): Nikon D810; 105mm f/2.8 Micro Lens; ISO 64; f/2.8; 1/160th of a second; tripod mounted. This pro-level lens is simply amazing. Normally used in wedding photography as a macro lens to capture rings and small items, it also makes for a wonderful portrait lens (a hidden secret). The bokeh (background blur quality) of this lens is truly beautiful. This angle is in portrait orientation. Shot 4 (MUA Morgan Mizell assisting Ann Gabrielle): Nikon D810; Lens Baby Composer Pro with Edge 80 Optic (80mm); ISO 64; f/11; 1/250th of a second; tripod mounted. The job of a photo assistant includes many tasks. Here, Morgan is focused upon the talent – and helping Ann Gabrielle look the absolute best – attention to every detail is paramount. Sometimes we miss something – but it’s not from lack of trying. Shot 5 (Singing): Nikon D810; 50mm f/1.4 Prime Lens; ISO 64; f/2; 1/250th of a second; tripod mounted. What a treat to hear her sing. This would later lead to my understanding of just how much she loves her art and singing, and why I chose the ultimate image that I did. I must admit I really like this one as well. Shot 6 (Hair-down BTS shot with Morgan): Nikon D810; Lens Baby Composer Pro with Edge 80 Optic (80mm); ISO 64; f/11; 1/250th of a second; tripod mounted. Thanks again to Morgan, a HUGE help on this photo shoot. Tripod: Gitzo carbon-fiber legs with a Really Right Stuff ball-head. Lenses Used: Nikon 50mm f/1.4 Prime; Nikon 105mm Micro f/2.8; Nikon 24-120mm f/4; Lens Baby Composer Pro with Edge 80 Optic. Lighting: Elinchrom RX400 mono strobe (x1) with 53″ Rotolux octabank as the key light; fill light was a Paul C. Buff Einstein mono strobe (x1) with a 41″ shoot-through umbrella – all other lights were hair lights and/or kickers (accent lights); an Elinchrom RX400 mono strobe (x1) with a snoot gelled with diffusion gels to kick light onto her brunette hair; Nikon SB910 speedlites (x3) with Magmod modifiers; Lights were triggered with Pocket Wizard radio controllers (x6) – Flex TT5’s, Mini TT1, and AC3 Zone Controller; stands – C Stand with boom, Manfrotto Nano stands, and Alzo 10′ stands. Both creative gels, as well as color corrective gels (CTO 1/4 strength) were used to help create mood and correct the color temperature of the ambient lighting. The Nikon SB910 speedlites and my Pocket Wizards are powered using Eneloop Pro AA rechargeable batteries. 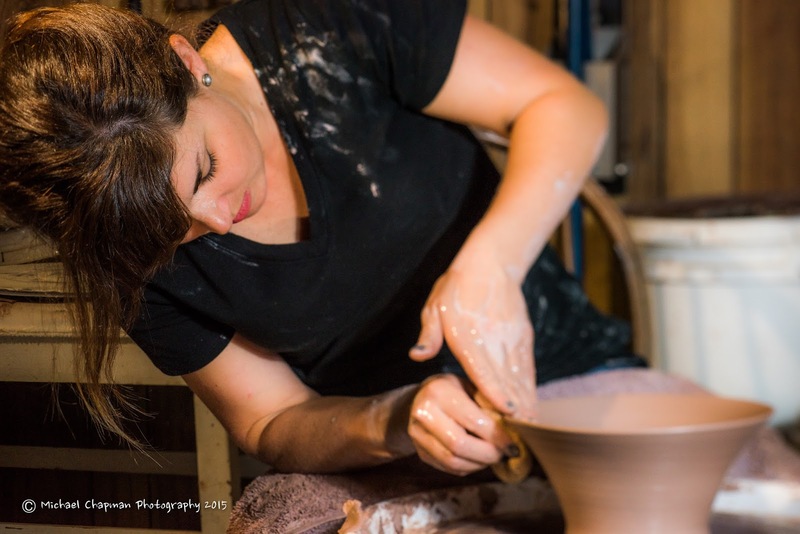 Aimee Guido is one of Natchez’ most creative and talented citizens. She warmly welcomed me for an inside look into her creative world: her painting studio (she prefers “shop”), as well as her ceramics workshop where she “throws” clay on her pottery wheel. In the image at left, she pauses at the door of her workshop, a doorway into a world of talent, creativity, and amazing works of both two-dimensional and three-dimensional art. In my “Characters of Natchez” photo series, I set out to photograph a limited number of local people and portray or reveal something that is uniquely them. In doing so, I use a photographic style, lighting technique, camera angle, lens choice and setting that fits them. I don’t use a one-size-fits-all approach and squeeze them into my “box” – the “box” changes with what best represents them. Harder and more taxing upon me? Yes. But, it’s also much more rewarding in the end because it stretches me artistically and creatively to fit the techniques and style to what will best reveal them. This is “subject-centric” photographing. My entire process is designed in every way to bring out the essence (or at least one aspect of it) of that person. That’s my goal anyway. Although I may shoot five hundred photos in a given session, I am working toward the one shot that best represents the person. That image … “the one” … is what I post to my portfolio’s “Characters of Natchez” section. However, in this blog I provide an extra shot or two and go into the back-story of the photo shoot to reveal a few more interesting details about the person and the session. A famous photographer once said that to produce a beautiful image, begin with a beautiful subject in front of your lens. Aimee Guido is easily that. She also is an amazing ceramic artist and a very gifted painter. When I thought about how to best go about photographing her, what came to my mind was the striking symmetry between her own feminine beauty, and that of her art. Her beauty is natural, and so there exists a poetic harmonism between her and the clay and pigments that she handles in creating her ceramic art and her paintings, as clay and pigments are natural elements of the earth. The environmental portrait that I chose as ‘the one” (the above image of her standing in the doorway of her workshop), was her idea to try. Great idea. Often, I’ve found that listening to what your subject’s own ideas are and even other people around on the scene, can immediately lead to great image captures … or, spark a creative thought of trying something different that is even better. What I like about this shot is that it is Aimee. She is smiling, relaxed, obviously comfortable in her own skin … it shows her in context of her creative workshop, a wood and tin structure that is warm, cozy and “chaotically creative” as I am fond of describing such spaces (I wish I had one of my own) … yet, I think there is bit more to this image. I believe it hints of a bit of mystery … it invites the curiosity in us to wonder just what all is in there through the doorway. We see a peek: her pottery wheel in the background awaits her – but we know somehow that more is there (and indeed there is). The lighting and point of view I chose is warm, angled, dramatic, and a bit dark … but in an inviting and interesting way. When I asked her if she realized that her hands were forming a “heart” shape when she pressed the clay, she said that she had no idea. I love the symbolism in this shot, as ceramic art is one of her great passions. I couldn’t use it as a portrait shot, because that’s not what it is. 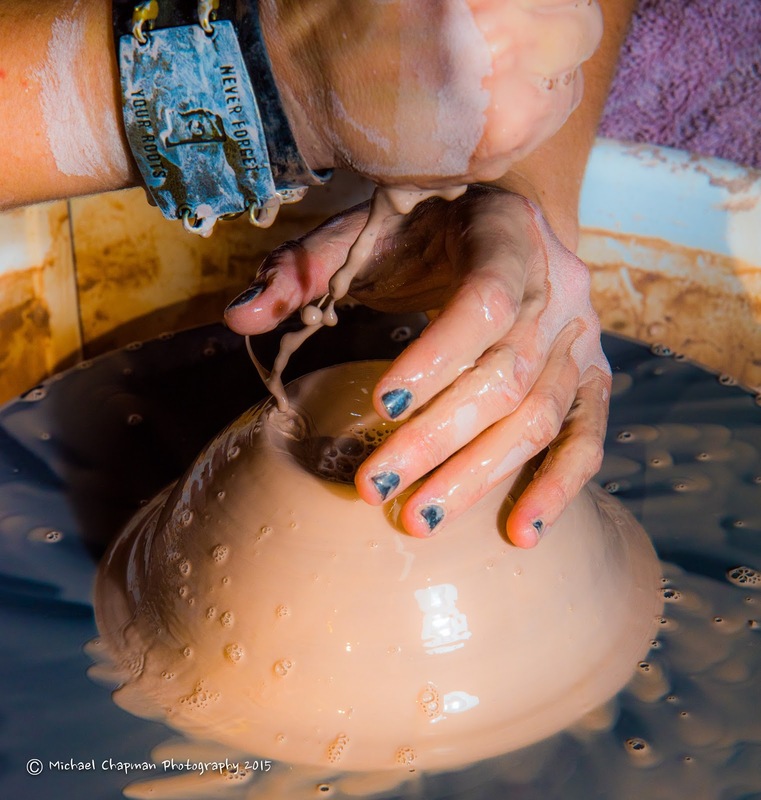 But, I wanted to share with you the intimacy of the image: her hands and how she uses them in close contact with the water and the clay as she creates her amazing three-dimensional art. The “heart” speaks for itself. While I was photographing her, she made seven or eight pieces of pottery. It was an education into the process, as well as fascinating to watch her work with the clay … pounding it, slapping it, kneading it (I’m sure those are all the wrong terms) … moulding and shaping it … all as it spun in various speeds on her wheel, controlled by a foot-peddle. In the image below, she squeezes water from a sponge onto the clay as it spins, making for a fun action image that is in tight. Beginning photographers might think that the shutter speed of 1/200th of a second is what froze the water mid-air, but that would be incorrect. When using strobes and flash, the shutter speed contributes to the ambient or background exposure. It is the flash itself that freezes the action here, as the instantaneous burst of light is in the many thousandths of a second. So, in flash photography there are actually two exposures you are dealing with. In addition to learning about the process of making clay into functional yet beautiful pieces of pottery, I learned more about Aimee. Somehow (and unfairly) I had the impression that she would never like to get dirty or sweaty. That’s probably an idea we have (or is it just me?) of painters in fine-art studios who seem to work in pristine environments in indoor studios with a mug of coffee just within reach (or would that be a glass of wine?). I’m telling on myself here, but it’s an image I think we have of painters sometimes. This is certainly not Aimee however. 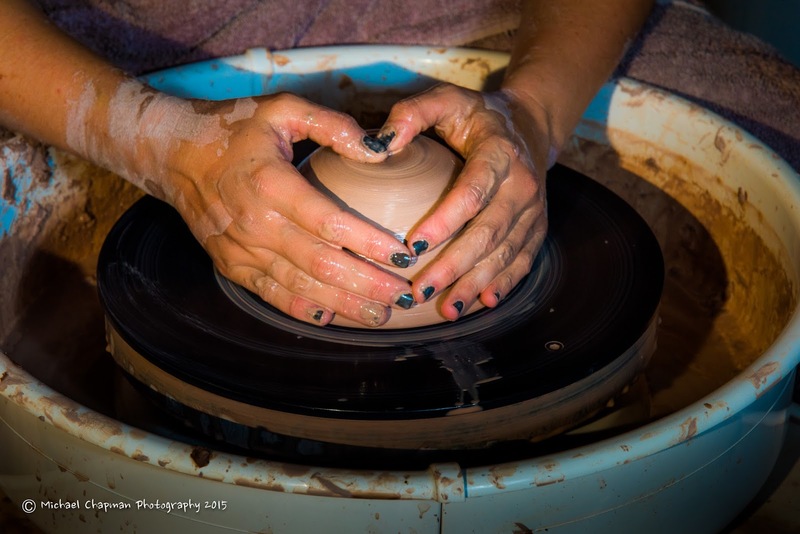 Perhaps my mistaken notion is one she has encountered many times, and why she prefers the word “shop” over “studio.” I learned just how hard she does work, and how she puts all of her small frame’s strength into “throwing” the clay. She got dirty, she was sweaty, she was fighting off bugs (and lizards! – that’s an inside joke), yet she was smiling almost the entire time. … and laboring away lovingly in her painting studio … er, shop … and in her little ceramics workshop, creating amazing ceramic art and paintings. I sincerely hope you’ve enjoyed this peek into Aimee’s work and life, and my process as a visual artist. To see more of Aimee’s work and read a bit more about her, visit her online at www.uniquelyaimee.com. Shot 1 (Doorway): Nikon D810; 50mm f/1.4 Prime Lens; ISO 64; f/8; 1/100th of a second; tripod mounted. This is a classic example of Environmental Portraiture: Aimee standing in the doorway of her ceramics workshop. Shot 2 (Hands in Heart Shape): Nikon D810; 24-120mm f/4 Zoom Lens (at 120mm); ISO 400; f/11; 1/250th of a second; tripod mounted. She had no idea her hands formed a heart shape. She said she would always think about that now, after I pointed this out to her. I think that’s pretty cool. Shot 3 (Water onto Clay Freeze-Action): Nikon D810; 24-120mm f/4 Zoom Lens (at 120mm); ISO 400; f/11; 1/200th of a second; tripod mounted. I love freeze-action photography – most often associated with sports photography. Flash, when allowed, helps capture some amazing images due to its super fast capture time. Shot 4 (Shaping the Clay): Nikon D810; Lens Baby Composer Pro with Edge 80 Optic (80mm); ISO 400; f/11; 1/250th of a second; tripod mounted. Quickly becoming a lens choice favorite of mine (though it is very difficult to master), this Lens Baby lens uses a “slice” of focus to emphasize a certain part of the image (similar to a Tilt-Shift lens) – here I placed it onto Aimee’s face – which blurs out the clay. I wanted the viewer to be looking at her. I love this shot of her working, in particular the shapes, curves, colors and warmth – very natural. Lighting: Paul C. Buff Einstein mono strobe (x1) with 27″ beauty dish, gridded, as the key light – all other lights were hair lights and/or kickers (accent lights); Elinchrom RX400 mono strobe (x1) with 8.5″ reflector; Nikon SB910 speedlites (x3) with Magmod modifiers; Lights were triggered with Pocket Wizard radio controllers (x6) – Flex TT5’s, Mini TT1, and AC3 Zone Controller; stands – C Stand with boom, Manfrotto Nano stands, and Alzo 10′ stands. Both creative gels, as well as color corrective gels (CTO 1/4 strength) were used to help create mood and correct the color temperature of the ambient fluorescent lighting. Remote Power: The mono-strobes for the Doorway shot were powered using a Paul Buff Vagabond Lithium Extreme external power pack, an amazing piece of equipment that allows me to be able to use my studio strobes on remote locations, far from electrical receptacles. The Nikon SB910 speedlites and my Pocket Wizards are powered using Eneloop Pro AA rechargeable batteries. Welcome to Brandon McCranie’s zany, creative, and talented world! In my Characters of Natchez photo series, I wanted to photograph a limited number of local people. My goal was to portray or reveal something in the photograph that would be uniquely them. To do so, I used a photographic style, lighting technique, camera angle, and setting that fit them. What I try to avoid is using a “one size fits all” approach. I didn’t want to force them into a single box, rather the box changed with what best represented each. This presented a challenge, but was much more rewarding because it stretched me artistically and creatively. This is known as “subject-centric” photography. This was the way I went into Creative Portrait – Brandon McCranie, a session with this well-known Natchez talent. With Environmental Portraiture the idea is to capture the person in their own environment. Contrasty, in Studio Portraiture, you photograph your subject in a studio with a backdrop. This can be very effective because it isolates the subject in the photograph and focuses only on them. Both have their own impact visually. For Brandon I chose to go on location and shoot him in his bottle-cap workshop or in his home environment. Of course, the down side to this approach are the logistics of lugging lighting and camera gear! At this time of year in Mississippi (early August) when the session is outside (as this one was), the heat, humidity and mosquitos make it a challenge. After scouting around, I found an awesome location that matched my vision for the portrait. It took me four hours to gather gear, set up, do test shots, and shoot the session. Even though I was going for one special shot, my session with Brandon consisted of just over three hundred photographs. Each one of the exposures were taken for a reason, and was a deliberate attempt at some nuance of angle, shift in pose, lighting or wardrobe change. Brandon and I worked hard at continually tweaked every little thing, including arranging the individual bottle caps on his table. In addition, Brandon’s wardrobe, hat, gesture, posture, my angle of view, framing, lighting, lens and so forth were all carefully chosen to bring out the goal of the image: to truly represent him authentically. That is shooting deliberately. While it is often a challenge, I love the adventure of exploring and working a shot creatively. At this point, a total of seven lights were employed, including studio strobes, a 53″ octabank (a large softbox), and various other high-tech lighting gear. We even plugged-in a $10 work light for some of the background lighting, so low-tech works perfectly well sometimes. The magic happened in this session when, following a hunch, I tried a very unorthodox lens for taking a portrait photo. A 16mm fisheye lens is normally used in special effects landscape kinds of shots. In fact, I knew if I kept him in the center of the frame the distortion on him would be minimized, but the rest of the scene around him would seem surreal. No doubt it was a risk creatively, by it was worth a try. Having him to lean in a bit made the shot work even more effectively. After using a couple of lenses, I asked Brandon if he had time for me to play around with a new lens. I had just received a Lens Baby Composer Pro. This lens, an Edge 80 optic, allows me to have “slice” of focus area in my shot. Additionally, I can also widen or narrow that slice of focus, and move it around in my composition. Portrait taken using the Lensbaby Edge 80 Optic. The image I captured of Brandon using the Lens Baby is shown at left. In my opinion it captured another very important aspect of Brandon. The main shot (above) captured Brandon’s public persona. He is energetic, full of life, creativity, and talent. All of which are contributors to his wild world of color, music, art, and fun that make him larger than life. I chose a 16mm fisheye lens in the above photo, because it “warps” (in a good way) what we experience when we encounter Brandon. We enter his world when we view that photo (at least I hope it conveys that). But, in this second photo, a very different Brandon is seen … a quiet, reflective, thoughtful man who has hopes, goals, and a faith of his own. I can say that because I got to talk with Brandon awhile during this long shoot about his life and the direction he finds himself on. As a matter of fact, we spoke candidly about our lives and aspirations, both as “creatives” but also simply as men who want to be better human beings tomorrow than we are today. In conclusion, Brandon is a complex person, as most of us are. He is a deep thinker, a thoughtful, reflective, philosophical man. Like many of us, he has chosen to make a better life for himself and lift others around him in the process. No doubt that while the first shot best portrayed what I originally set out to do, the second shot portrayed another authentic aspect of Brandon. This is what is amazing about photography: how photos can tell very different stories, even if they are of the same subject just minutes apart. So, welcome to Brandon’s world … both of them! I hope you enjoyed the images and the peek behind the process of what I do, and how I got these shots. If you would like a “once-in-a-lifetime” portrait that captures some aspect of who you really are, then CONTACT ME to discuss your portrait. And remember, there’s always more going on around you – and inside of people – than what meets the eye. Shot 1 (Top): Nikon D810; 16mm f/2.8 Fisheye Lens; ISO 64; f/2.8; 1/250s; tripod. Shot 2 (Bottom): Nikon D810; Lens Baby Composer Pro with Edge 80 Optic (80mm); ISO 400; f/11; 1/5s; tripod. Lighting: Elinchrom mono strobes (x3) with 53″ Octabox as key light (all others accents and kickers); gridded 8.5″ reflector; and one with a snoot to light anvil & front work table; Paul C. Buff Einstein mono strobe (x1) with shoot through umbrella; Nikon SB910 speedlites (3) with magmod modifiers; a $10 shop light with silver reflector to help light the background. The lights were triggered with Pocket Wizard radio controllers (x6) – Flex TT5’s, TT1 Mini, and AC3 Zone Controller. Flags were used to block unwanted light sources from nearby lights.